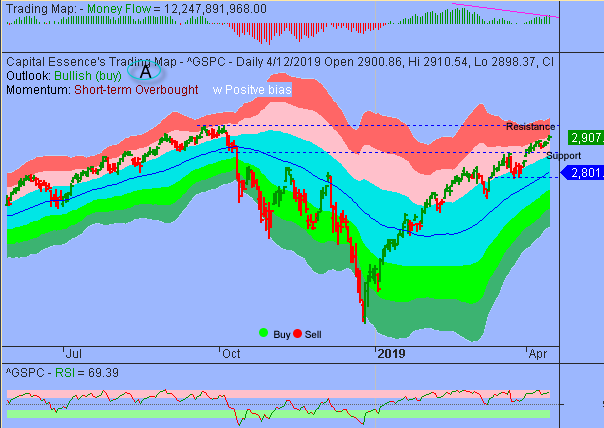 Good Morning, this is Capital Essence’s Market Outlook (the technical analysis of financial markets) for Monday April 15, 2019. Stocks rose on Friday as a strong earnings report from JPMorgan Chase (JPM) and optimistic response to Walt Disney’s (DIS) upcoming streaming service. For the day, the S&P gained 0.7 percent, the Dow Jones Industrial Average gained 1.0 percent, and the Nasdaq Composite gained 0.5 percent. The CBOE Volatility Index (VIX), widely considered the best gauge of fear in the market, fell nearly 8 percent to 12.01. Stronger-than-expected exports data out China also lifted stocks. Exports in China rose 14.2 percent in dollar terms last month, nearly double what economists expected. As such, the Materials Select Sector SPDR ETF (XLB) rose 1.32 percent on the day but is up 15 percent YTD, slightly underperformed the S&P. Now the question is whether the rally has more legs? Below is an update look at a trade in XLB. Our “U.S. Market Trading Map” painted XLB bars in green (buy) – see area ‘A’ in the chart. 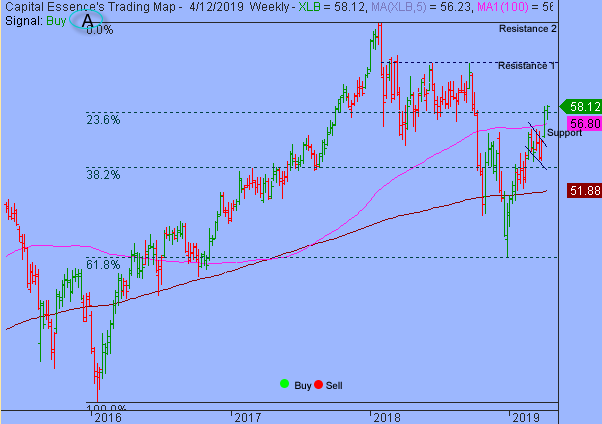 XLB has been on a tear in recent weeks after the March correction found support near the 38.2% Fibonacci retracement of the 2016-2018 upswing. Last week’s upside follow-through confirmed the early April bullish breakout from the March bull flag pattern and opened the gate for a test of the spring-summer 2018 high, near the 61-62 zone. A close above that level will trigger acceleration toward the early 2018 high, just above 64. XLB has support near 56.80. Short-term traders could use that level as the logical level to measure risk against. Short-term technical outlook remains bullish (buy). Last changed April 10, 2019 from bearish (sell) (see area ‘A’ in the chart). Key technical development in Friday session was a clear break above 2900. That level was significant when the S&P fell below it in October 2018. The bullish breakout would be confirmed on another close above 2900, which would support upside follow-through and a test of more important resistance in the 2940 area in the coming days. Nevertheless, S&P is short-term overbought follow recent advance so it should not be surprising to see some kind of a pullback, the way we had in February and March, prior to the new upswing. Short-term trading range: 2890 to 2940. S&P has support near 2890. A close below that level has measured move to 2870-2850. The index has resistance near 2940. A close above that level has measured move to around 2970, or the upper boundary of the red band. Long-term trading range: 2770 to 2990. S&P has support near 2770. A close below that level has measured move to 2660. The index has resistance near 2990. A close above that level has measured move to 3100. In summary, S&P cleared key resistances, breaking above the 2900 level for the first time since early October 2018. Consecutive close above 2900 would signify a breakout and supporting upside follow-through in the weeks ahead. However, market is short-term overbought following recent advance. There could be a sell-off in the offing but it would be shallow if so.